Legion FC Recap: Clutch! Provides Parking for Hundreds of Fans during Legion’s First Home Games | Clutch! 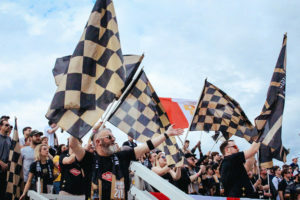 As the Birmingham Legion FC made its official debut in the Magic City, Clutch! debuted as the football club’s official parking partner. Clutch! will be providing parking for every Legion FC home game at BBVA Compass Field. All lots will be managed by the team at Nice Guy Valet. There are two different ways that fans without a season pass can park with Clutch! for Legion FC games. Fans can download the Clutch! app, select which match they wish to attend, and reserve their parking in the lots available. Parking spots are available now through the end of the season and can be reserved up to the day of the match. Fans can also drive up to the lot on the day of the game and pay via credit card or cash. However, this parking is not guaranteed, as the lot may fill up at any time. The only way to make sure you have the perfect parking spot on gameday is to reserve it through the Clutch! app! Clutch! provides two lots for Legion fans to choose from. The Flat Lot is right across the street from the field, and the parking deck is only a four-minute walk. Fans can begin arriving at either of these lots three hours before the match and continue to arrive as late as 30 minutes after the match begins. According the Daniel Almond, Director of Business Development, the team is excited for what a relationship like this will mean for the company and the future of gameday parking. Because Clutch! is the official parking provider for Legion FC, this means that fans can not only purchase their parking through the Clutch! app as they have done previously, but Legion FC season parking pass-holders can claim, use, and transfer their season passes all on the app. The home opener on March 10th brought a positive response for fans. The Clutch! team and wonderful staff at Nice Guy Valet were able to park over 500 cars, 190 of those being Legion season passholders. Birmingham resident Paul Styslinger shared his experience using Clutch! for the Legion home opener. According to Almond, the success of the Legion FC partnership is in part due to Clutch!’s presence for other big Birmingham events like the Mercedes Marathon and upcoming Barons games. “We have had a terrific response to Clutch! at Legion games thus far,” Almond said. “We are reaching a new group of users in the Legion fans, but are also seeing a lot of local fans who have used Clutch! before. Birmingham locals are hopefully starting to recognize us as their go-to for a lot of their sporting events. The team’s most recent match against Ottawa Fury proved that fans are continuing to enjoy the Clutch! experience, as hundreds of spots were sold for the second ever Legion home matchday. What’s Next for Legion FC + Clutch!? Almond believes partnering with Legion FC is the beginning of creating streamlined gameday experiences for fans in Birmingham. Better yet, Clutch! is hoping that the relationship will create opportunities to get fans their gamedays back across the nation. The team is so thankful for this partnership and is excited to serve Legion and its fans throughout the 2019 season! You can reserve your parking spot for Legion FC matchdays by downloading the Clutch! app today.